While we normally don’t think about standards unless their absence causes inconvenience, it would be extremely difficult in fact to imagine daily life without standards. 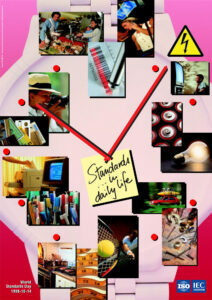 Take any scenario, and you will be amazed just how many standards support that aspect of daily life. From the moment you wake, throughout the day, standards in some form are helping to shape your day, to make it easier, more comfortable, safer, and simply more convenient. Imagine, for example, not being able to withdraw money from an automated telling machine (ATM) because your bank card is too big to fit in the slot; imagine batteries that will not fit any of your electrical equipment; stores without barcodes to quantify and price stocks of goods; imagine Internet sites without standardized domain names. The truth is that a day without standards is inconceivable. In today’s world, where we expect fast, efficient communications, we demand compatibility and interoperability between electronic appliances, and we want our work tools, our consumer goods and our products to be cheap, easily available and of the best quality. International standards are hence absolutely essential – even if most of the time they are so invisible as to be taken for granted. When they do their job, you are glad they are there, but the idea barely crosses your mind that you are being “protected” by International Standards. Yet you are. In the mind of the person in the street, a standard refers to a “benchmark” that has been selected as a model to which objects or actions may be compared. They provide the end-user with a criterion for judgement, a measurement of quality, and a certain guarantee of compatibility and interoperability. Whether it is a standard to ensure global linking of telephone networks, a standard to ensure that life-saving medical equipment in the hospital is electromagnetically compatible, or a standard to help a company in providing a service that is quality managed and environmentally friendly, International Standards provide a veritable backbone for daily life. They encourage an improved quality of life by contributing to safety, human health and the protection of the environment. Standards are so useful and relevant to daily life because they are based on the experi-ences of daily life itself, and developed from the perceived needs of actors in the different spheres and fields. They are thus the material results of these experiences, establishing a workable compromise between state-of-the-art technology and the economic constraints. International standards are the consensus-based documents which are adopted nationally or regionally on a voluntary basis. ISO, IEC and ITU, whose scopes of standardization complement each other, form a complete system for the supply of voluntary international technical agreements. Published as International Standards or Recommendations, these agreements are helping to bring about the compatibility of technology worldwide. If machines, systems or devices work together, in many cases you have International Standards to thank for it – even if few are those that realize it. Standards are developed in response to the needs of life today; the three organizations’ work programmes are geared to deliver the International Standards for tomorrow, the daily life of meeting an ever-changing spectrum of technological innovation.